This class will provide you with ways to examine and develop how you think about yourself and others, as well as how you express yourself. You will be able to focus on interpersonal skills, behavior, and environment, to see how they promote diversity-positive interactions, as well as learn causes for discriminatory practices and create an action plan for increasing workplace acceptance and harmony. Uncover and discard beliefs and attitudes that foster or block progress. By discovering your strengths as well as liabilities, you can build on the positive and move toward minimizing the negative. As a result, you will gain greater personal and professional satisfaction. Find new perspectives and ways to turn challenges into opportunities. Become skilled at ways to further develop self-awareness and sensitivity. 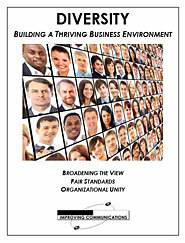 Discover value in diverse perspectives and personalities and their benefits. Strategize ways to strengthen relationships and turn negative into positive interactions. Understand and communicate value to staff. Thank you very much for the wonderful and informative session. The audience was totally engaged and interested in your presentation. I want to congratulate you on a job superbly done and for all the effort that went into making this a successful seminar.